SEPT-ÎLES, Que. — The scenario is common: The men leave to work on a job site, and the women stay home with the kids. The men return after a few days or a few weeks, completely exhausted, but so are their spouses at this point. They've taken care of the house, endured the children's tantrums, and sometimes worked a job as well, often earning 40 per cent less than their partners. When things fall apart, women from Quebec's North Shore find themselves with almost nothing. Their wages alone won't cover rent in the city, where the cost of living has dramatically increased since the announcement of Plan Nord, a provincially funded strategy to develop the mining and energy sectors in northern Quebec. In Sept-Îles, 600 kilometres east of Quebec City, the economic boom started in 2011-2012, under then-premier Jean Charest. Companies and people began pouring in, hoping to make a bundle of cash. Then came the closure of the Cliffs Natural Resources pellet factory and layoffs at the Lac Bloom mine, affecting many families. The painful realities of economic uncertainty in the North Shore region hit women the hardest, and they are often the first to suffer from the fallout, according to women's groups. "When I worked for Quebec Native Women, I told Mr. Charest that yet again, many would be forgotten — the First Nations and women in general," says Michèle Audette, who is now the president of Native Women's Association of Canada. High salaries abound in areas like Quebec’s North Shore, which tends to reinforce traditional gender roles for men and women, says Marilène Gill, a co-ordinator for a local women's association. Women represent a tiny percentage of the construction workforce — a meagre 1.3 per cent in 2012. The other women on construction sites occupy secondary jobs as cleaners or running the canteen. "Construction single moms," whose partners are sent up North for a fixed period of time, have to shoulder all the household responsibility until they return. In some cases, the company pays for the family's housing. But if the couple splits up, the woman finds herself with nothing. "After separations or divorces, [ex-spouses] are not allowed to stay in a house belonging to ArcelorMittal or Cliffs, and that's when they end up with us," said Maude Gauthier, director of a women's shelter in Fermont, Que. Economic hardship is not the only battle for the women of the North Shore. There has been a steady increase in assault cases in the North Shore region since 2003, says Isabelle Fortin, director of a Sept-Îles organization that supports victims of abuse. And it's a worrying trend that shows no signs of slowing. The most recent data from Quebec's provincial police shows that the number of sexual assaults is on the rise across Quebec. There were 102 formal complaints filed between April 1, 2013 and March 31, 2014, up from 81 cases for the same period in 2012-2013, and 67 in 2011-2012. The rate of violence in the North Shore region is similar to the rate in Abitibi in northwestern Quebec, where there are also several mining projects. "All these things are connected, but we're only seeing isolated issues," says Gill. In these small communities where everyone knows each other, it's rare for women to seek help. They fear judgment from their neighbours, and one women's group says it often takes days for emergency services to respond to a call for help from a battered wife. Michèle Audette has received a call from an Innu woman who says she was a victim of racism and sexism from fellow workers. 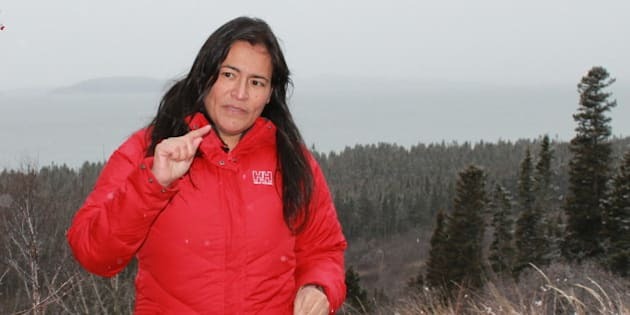 But the alarm bells really started ringing when Audette's mother, an Innu herself, called to tell her two Innu girls had been raped on the La Romaine construction site. La Romaine is an important hydroelectric complex on the north shore of the St. Lawrence. The Innu face racism and discrimination, something Gill's women's group is speaking out against. "They are already so stigmatized," she said. "As if they deserved what was happening to them." Plan Nord's honeymoon phase is over, as commodity prices have fallen and spurred mine closures and layoffs. The current Couillard government will be rolling out a new five-year plan in January with more modest provincial investment. But the prospect of new construction sites is not good for women, say women's groups, who feel that the Couillard government's grand project is being "shoved down their throats." When you combine this with the announced cuts to health services and daycare, the Plan Nord presages nothing good for women living north of the 49th parallel. "It is people from the outside who will benefit from it, and many women will be left only with trauma," says Gill. "The message we're sending them is, 'You'll just have to deal with it!'"